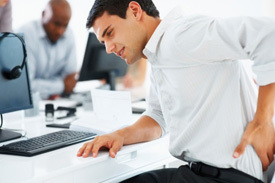 Extensive sitting (work, home or driving) can lead to lower back pain. Sitting puts more pressure on the low back than standing! Frequent breaks can help with a good guideline being to get up and walk or stretch every 30 minutes. Even if you have back pain exercise shouldn’t be skipped! Our bodies are designed to move and walking, yoga and stretching help with healing. Carrying around a heavy backpack, handbag or briefcase can be a prime cause for back pain. You shouldn’t be carrying more than 10% of your body weight. Heavy bags on one shoulder can also imbalance the shoulders and back putting extra pressure on your spine and back muscles. It is best to keep balanced wearing both straps of a rucksack. If you have to carry a shoulder bag or suitcase ensure you keep the load light and alternate sides. Your back bears the burden of carrying around excess weight. The spine is designed to carry the body’s load and extra weight can lead to possible structural compromise, particularly in the lower back. A healthy diet and losing weight can help reduce back pain. Holding tension in the body causes increased tightness in your muscles and back. Finding ways to de-stress are important to release tension from the body. Exercise, yoga, swimming and mindfulness/meditation can be beneficial. If you have back pain your mattress should be changed at least every 7-10 years. A worn out mattress causes your back to sag putting extra pressure on your spinal joints and discs at night. We spend more than a third of our lives sleeping – so it’s very important to invest in a quality bed and mattress! High heels can play a significant role in low back pain. High heels put the foot at an angle leading to disruption of your natural form and posture. This can affect the alignment of your back and put pressure on the spinal joints and muscles. Wearing high heels in moderation and keeping your heel height no more than two inches if possible will help . If you are suffering from any aches or pains don’t wait till its unbearable, book an appointment with one of our chiropractors today!